From $0.35 to over $2.00 to $0.35 in DAYS. I have never seen anything like this. Yeah PEEK did that but at least that was over a period of over a year and based on various issues that the market didn't like over time. How the hell can something like this happen? Almost as bad as NNA except without actual news to justify the move. Glad I was never a part of that one, recommending it anywhere outside of its relationship to IDK. Also glad that I sold a lot of IDK and APP shares high and mentioned that in my blog. A chance to buy back cheaper now which I took advantage today and I guess I will be doing tomorrow. Might even buy into SX since it looks like a very decent opportunity. Those Zeu guys will want to cash in their $1.00 warrants at some point in time. A lesson can be learned from this situation. This is not a good start for Sheldon Inwentash if he is trying to reclaim his lost rep from the Pinetree debacle. Volatility can be a trader's friend and we know what we are getting into on the Venture/CSE, but if he wants his fund taken seriously it's going to need a little more stability than this. I have a very, very hard time believing that this crater in the Inwentash basket isn't due to some serious dumping by one or more individuals or entities that are known to him, even if that's completely out of his control. He needs to pay more mind to who he associates with in that case. Can't blame the market either. US stocks like OSTK, RIOT, KODK and bitcoin and HIVE were all trading pretty well today and since bitcoin dipped under $10,000 yesterday. This is a distinctly Inwentash phenomenon. Sheldon Inwentash has been selling his stake in Global Cannabis Apps (FUAPF) (APP.C). Before we get into why he might be doing this, let's set the record straight on how much he has been selling and what he still owns, along with his fund ThreeD Capital (IDK.C). On December 27th he sold 150,000 shares. On January 2, 1,000,000 shares. On January 3, 800,000 shares. On January 4, 900,000 shares. That is a total of 2,850,000 shares. Brownstone Energy is the old name of ThreeD Capital. It sold 1,000,000 shares. "Of this total, ThreeD held an aggregate of 4,000,000 of the Post-Closing Shares and 3,000,000 of the Post-Closing Convertible Securities (representing approximately 7.0% of the issued and outstanding common shares of the Company, or approximately 11.6% assuming exercise of such Post-Closing Convertible Securities only), and the Joint Actor held an aggregate of 1,850,000 of the Post-Closing Shares and 250,000 of the Post-Closing Convertible Securities, representing approximately 3.2% of the issued and outstanding common shares of the Company (or approximately 3.6% on a partially diluted basis, assuming exercise of such Post-Convertible Securities only)." Here is a chart that summarizes the variance in position between what was disclosed on November 29 and what SEDI shows us today. What are the facts we can gather from this? 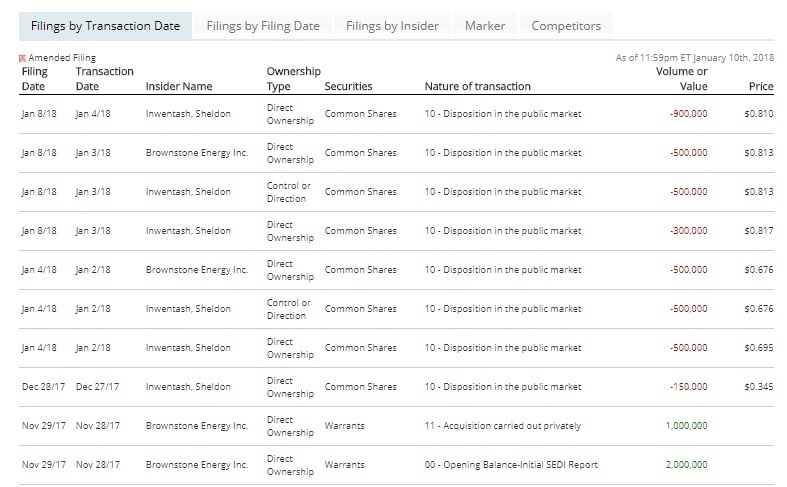 The CanadianInsider report marks 2.85 million shares sold from Inwentash. Either he picked up a million more along the way and sold them, or the report is double counting the Brownstone sells which I would say is very likely given the duplicate volume and price of the transactions. So lets go with IDK and Inwentash selling a combined 2.85 million shares, everything not in lockup. Inwentash has 250,000 warrants remaining but that is probably some kind of advisory fee bonus which would likely be in lock up too. Now why would they do this? First, it's natural to take profits when you are in early and have a large position. I have done it on a part of my position and recommend that others should take some profits off the table so it would be hypocritical for me to blame him for doing the same. Second, look at the days he sold. On January 2, the stock went up 66% and hit a new 52-week high. On January 3, it rose 26% and hit its high of $0.99. Only on January 4 did it drop, 16% to $0.76. There is a good chance that he got filled on limit orders on January 2 and 3, in a similar way that I recommend people should sell - with numerous limit orders at different price levels. January 4 was the only transaction that could be considered a dump. We don't know his motivation for selling, but we do know that IDK has had a lot of activity going on with other stocks. His sell, rather than being a bearish outlook on APP, could just be him freeing up capital to fund other investments. He very well could think that APP will double from its current price but if he thinks other stocks will triple, that would suggest more capital should be allocated to those ones. If he had taken the cash and rode off into the sunset, that would be more alarming. But the way he has been talking (discussed before in my previous blogs) and how active IDK has been in the market, suggests to me it is merely capital allocation. Now obviously, no matter how I spin this, it's not great news that he sold every share that he could. That is why I always recommend to sell into strength and buy on dips. I think I will have a dip buying opportunity over the next few days until APP can release some news and/or get on Fox Business TV. Now we see that Inwentash, an experienced trader, follows the same principle of selling into strength as I do. We'll see if he also buys on weakness like I plan to do.